Credit Default Swaps are often thought of in terms of providing protection against credit events. However in many instances CDS are used to simply hedge against mark to market losses even if there is no default. Some use Index CDS to reduce volatility of portfolios due to spread fluctuations. The concept is that if the underlying portfolio spread widens, the CDS premium should increase as well, providing some cushion against losses. However the basis spread between cash securities and CDS can widen dramatically, making the hedge fairly ineffective on a mark to market basis. In 2008 some investors wanted to take advantage of that spread, hoping for convergence. The idea is that if a bond yield, less the financing cost (to leverage the bond), is higher than the CDS protection, one can make a "riskless" return by owning the bond and the CDS. The assumption however is that one has the ability to hold these bonds and the CDS to maturity. But in 08 that assumption went out the window, as banks asked for additional margin to leverage bonds even if they were hedged with CDS. In addition to that, hedge fund redemptions forced managers to raise liquidity. These two events combined to force the unwind of the basis trade, making the bond-CDS spread widen even more. The wider spread created mark-to-market losses for other basis trade holders, forcing them to unwind as well. It was a punishing cycle. Those who hedged their portfolios with Index CDS saw their hedges fail, as the CDS premiums did not rise nearly as much as the portfolios got marked down. It was particularly painful for those who had to unwind the portfolios, crystallizing the mismatch. 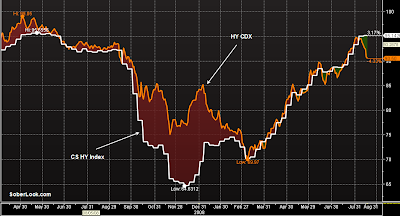 The chart below tracks the value of the Credit Suisse High Yield (a diversified basket of cash bonds) index vs. HY CDX (index CDS on a basket of HY names). CDX here is shown in terms of price equivalent rather than spread (if premiums increase, the effective "price" drops). End of 08 spelled disaster for many who had these types of hedges on, particularly if they beleived their portolios were neutral. The hedge stopped tracking the portfolio completely. 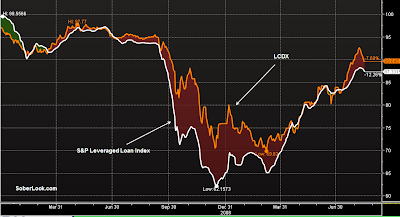 A similar scenario occured with leveraged loan portfolios. The hedge (LCDX) broke down. In addition, during that period the loans and the LCDX became illiquid, making it even harder to unwind. LCDX performed so poorely as a hedge, it never really recovered from the "ineffective" image and continues to be illiquid. "Neutralizing" credit portfolios with Index CDS hedges is no longer viewed as reliable strategy. Managers still use these products, but it's no longer considered a dependable hedging program on it's own.